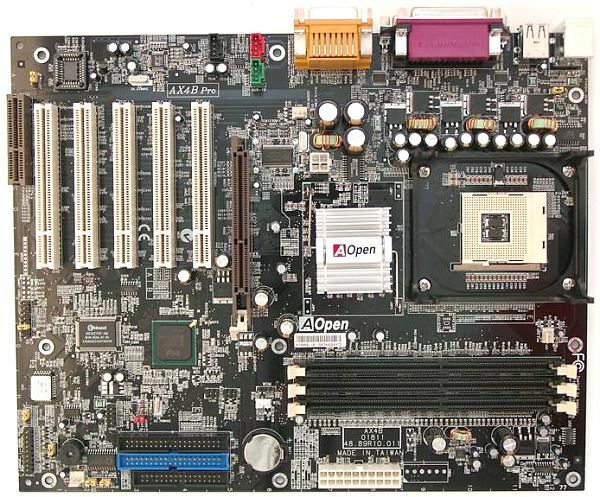 The board from the famous company is based on the black textolite with a silvery aluminum heatsink. The layout is rather good, except audio-ins which are located in front of PCI slots. It's not difficult to reach jumpers even when the board is already installed. On the back side there is a plastic plate meant for massive coolers. The 3-channel switching voltage regulator incorporates 12 capacitors of 2200 uF. The following controllers are integrated: an audio one based on the capabilities of the chipset and an Analog Devices codec (AD1885). 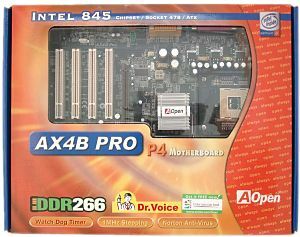 The board supports AOpen's Dr. Voice technology (which reports about problems occurred during booting), and there is space for the second EEPROM chip for the DieHard BIOS technology (similar to the DualBIOS of Gigabyte). 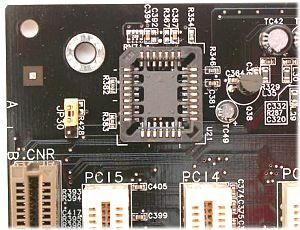 Non-unsoldered connectors: connectors for readers of smart cards and flash cards of the Memory Stick format. To realize them it's necessary to have a different I/O connector. The system monitoring is supported. 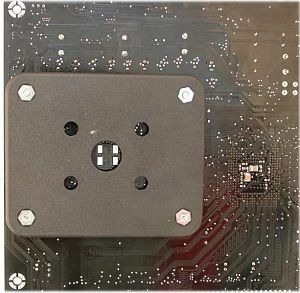 Processor voltage (+/-3.3, +/-5 and +/-12 V), speed of 3 fans and temperatures of the processor (a built-in sensor) and the board (a built-in sensor) can be controlled. There are 3 connectors for adjustable connection of fans. Brief characteristics of the board: memory slots - 3 DDR SDRAM; expansion slots - AGP/ 5 PCI/ CNR; I/O ports - 2 COM/ LPT/ 2 PS/2/ 4 USB; dimensions - 305x245 mm. The board has an average speed, is quite stable and will be a good purchase for an average user.